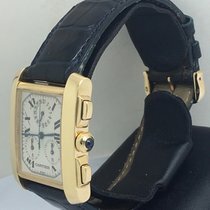 This Cartier Chronoflex is in great condition and is made of 18K Yellow Gold. The dial is white with black Roman Numerals and blue toned hands. The bracelet is made of 18K Yellow Gold and measures approximately 7 1/4" including case. 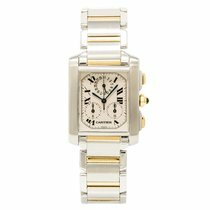 Model number is 1830 and serial is MG. Comes with Cartier Box, Instruction Booklet, and Cartier DVD.